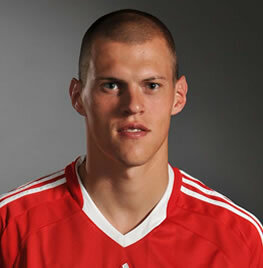 Martin Škrtel is a Slovak footballer who plays as a centre back for Liverpool and the Slovakia national football team. He also goes by the popular moniker "Terminator". Škrtel played as left wing or striker until the age of 16 when he was asked to fill in as a centre-back for the Slovak youth team. Škrtel started his professional career at FK AS Trenčín playing in 45 games for them between 2001 and 2004. Škrtel made his debut for Zenit Saint Petersburg in a Russian Cup match on 31 July 2004. He played 113 times and scored 5 goals for the club. Škrtel joined Liverpool on 11 January 2008 on a four-and-a-half year contract for a transfer fee of £6.5 million. Škrtel was voted man of the match by Liverpool supporters on Liverpoolfc. He scored his first goal for Liverpool in a 2–2 draw with Manchester City on 21 November 2009. He scored his second career goal for Liverpool on 28 November, opening the scoring at Tottenham at White Hart Lane. Škrtel was awarded Liverpool Player of the Season in May 2012. Škrtel played international football for Slovakia youth teams, before making his debut in the senior squad in 2004. He played a crucial part in the side's 3–2 win over reigning champions Italy as he played in every match of their world cup campaign, which saw Slovakia reach the knock-out stages ahead of the Italians. Martin Skrtel: Thank you for the memories and good luck for the future!